The below is a (short) chapter I wrote for the recent book “The Curious Country“, published by the Australian Office of the Chief Scientist. ACCESS to cheap and reliable energy has underpinned Australia’s development for decades. Fossil fuels — coal, oil and natural gas — provided the concentrated energy sources required to build our infrastructural, industrial and service enterprises. Yet it’s now clear this dependence on carbon-intensive fuels was a Faustian bargain and the devil’s due, because the long-run environmental and health costs of fossil fuels seem likely to outweigh the short-term benefits. In the coming decades, Australia must tackle the threats of dangerous climate change and future bottlenecks in conventional liquid-fuel supply, while also meeting people’s aspirations for ongoing increases in quality of life – all without compromising long-term environmental sustainability and economic prosperity. Fortunately, there are science and technology innovations that Australia could leverage to meet these goals. How can Australia shift away from coal dependence and transition to competitive, low-carbon alternatives, and what role will science and engineering play in making it happen? To answer these questions, a key focus must be on electricity generation technologies — electricity is a particularly convenient and flexible ‘energy carrier’— and to consider the key risks and advantages with the alternative energy sources that will compete with fossil-fuel power. In 2012, the majority of Australia’s electricity was generated by burning black and brown coal (75 per cent), with smaller contributions from natural gas (13 per cent), hydroelectric dams (8 per cent) and other renewables (4 per cent). The nation’s installed capacity now totals over 50 gigawatts of power generation potential, with stationary energy production currently resulting in the annual release of 285 million tonnes of carbon dioxide, about 52 per cent of our total emissions. Clearly, the non-electric energy-replacement problem for Australia would also need to consider transportation and agricultural fuel demands. In a world beyond oil for liquid fuels, we will need to eventually ‘electrify’ most operations: using batteries, using heat from power plants to manufacture hydrogen from water, and by deriving synthetic fuels such as ammonia or methanol. Under ‘business as usual’ forecasts produced by Government energy analysts, electricity use in Australia is expected to grow by 60 to 100 per cent through to 2050 with hundreds of billions of dollars of investment needed in generation and transmission infrastructure just to keep pace with escalating demand and to replace old, worn out power plants and transmission infrastructure. At the same time carbon dioxide emissions must be cut by 80 per cent to mitigate climate-change impacts, via some combination of enhanced energy conservation and new supply from clean energy sources. 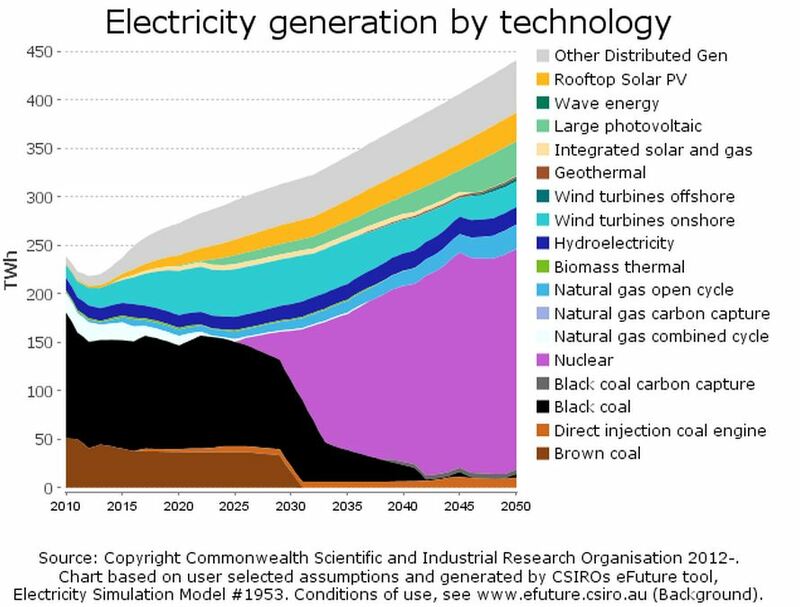 Although there are a huge number of potential energy options now being developed that might one day replace coal in Australia not all alternatives are equally likely. The current government renewable energy target has Australia aiming to derive about 30 terawatt hours of electricity from some combination of wind, solar, wave and geothermal (hot rock) energy by 2020, compared to 10 terawatt hours from these non-hydro renewable sources in 2011. (A terawatt equals a trillion watts) The target is driven by legal mandates and financial incentives. But beyond this modest market penetration their future is uncertain. The challenge is daunting. Although there are promising low-carbon exemplars — Norway gets almost all its electricity from hydro and France derives 80 per cent from nuclear energy — historically, no country has achieve a penetration of solar or wind beyond about 20 per cent of supply. 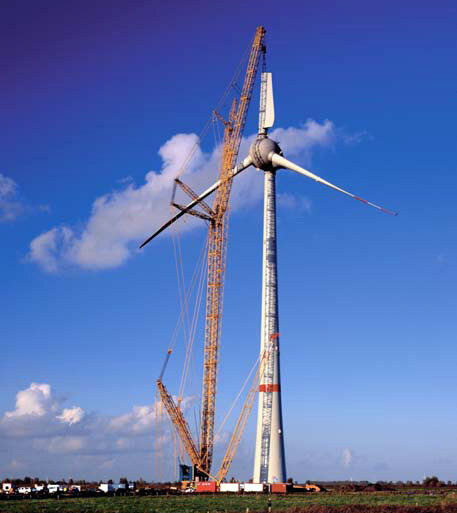 Denmark has the highest penetration of new renewables, per capita, based largely on wind power. Yet even the Danes still rely on domestic coal and imported nuclear and hydro to meet their reliable baseload power needs and have high domestic electricity prices. If Australia is to push significantly beyond the 20 per cent for non-hydro renewables to 50 per cent or more by 2050, this expansion will need to be underpinned by stunning advancements in large-scale energy storage with significant cost reductions, along with ubiquitous ‘smart grid’ technologies (see the next essay in this chapter for more details) to balance supply-demand and improve the efficiency with which energy is managed. All this is possible but the key issue of whether variable renewables with storage can win the cost-benefit competition remains a large unknown. To achieve the long-term goal of phasing out coal and slashing greenhouse gas emissions, Australia must actively invest in the science, technology and commercial demonstration of next-generation electricity infrastructure. Ideally, the underpinning technologies will be fit-for-service, low-carbon “plug-in” alternatives to fossil energy that are scalable, reliable and cost-effective, while also balancing issues of societal acceptance and fiscal and political inertia. Also, although infrastructure and fuel costs will be critical considerations, a technology must also constitute “value for money” by deliver its intended service adequately. For a new electricity generator to serve as a direct ‘fit-for-service’ replacement for coal, it should be dispatchable (i.e., can be delivered on demand) without need for large or expensive external storage, or else have a reliable fuel supply. It must also have low or moderate carbon-emissions-intensity, and be able to produce at a high capacity factor (i.e. deliver a near constant supply across a 24 hour period or longer). As described in the “Further Reading” section, this can potentially be achieved in diverse ways, via a portfolio of non-carbon or low carbon fuels (nuclear and biomass), the tapping of constant or predictable flows of natural energy from geothermal, tidal and wave power, and by geographically spreading wind and solar collectors across nation-wide grids, from urban zones to farmland to deserts. Clearly, different electricity technologies will fill a variety of niche roles in future markets. Variable renewables, such as wind turbines and solar collectors, are ‘clean’ in that they harness energy that is constantly being replenished, and they enjoy strong community support. Their use will continue to grow in Australia, especially as deployment costs are reduced. Three new and promising substitutes for coal that Australia might consider seriously pursuing are advanced nuclear reactors based on small-modular (factory-built) designs, deep-earth ‘hot dry rock’ geothermal, and ubiquitous small-scale solar. These clean-energy technologies offer many attractive and often complementary features, yet none are currently cost-competitive with coal, oil and gas, being technically immature or at least unproven at a large scale. As such, all are considered financially risky. There are real and exciting opportunities for science to work to improve and demonstrate these innovative new technologies, but technologists must collaborate with government and industry to ensure the markets are ready. Ultimately, there is no ‘magic bullet’ energy source that can solve all problems perfectly without any negative impacts to society and the environment. Given this reality, energy plans that expand the role of both nuclear and various promising renewable and energy storage technologies, and allow them to compete on a level playing field, seem to make most sense. The wholesale replacement of fossil fuels with cleaner alternatives represents a massive global conundrum, because we have to continue to provide reliable and affordable energy while reducing greenhouse gas emissions. So what can Australia — a relatively small part of the world economy — do to most effectively contribute to this effort, beyond supporting basic and applied scientific research? Australia has been a world leader in the development of lower-cost and more-efficient crystalline solar photovoltaics, and is working at the scientific cutting edge in the research and development of new organic solar cells and solar-thermal dish technology. Support for such work should definitely continue, but we must also not shirk from some risk taking, by engaging in more controversial fields like next-generation nuclear and carbon-capture-and-storage. Above all, we must ensure that scientifically grounded, government-led climate strategies are clearly focused on measurable and timely reductions in greenhouse-gas emissions. The rapid deployment of high-capacity clean-energy technologies need to work as direct substitutes for fossil fuels. It will mean strategic investment in a portfolio of potential ‘winners’ (Box 1), while accepting that there will probably be more failures than successes. In this context, it’s necessary that the best technologies get their due opportunity by taking a firm, hands-on approach. Time is not on our side. This will require a sustained early injection of money from a coalition of nations to create the manufacturing, distribution, education, security and skills-base that is absolutely necessary for a 21st-century re-imagining of energy. I’d argue that Australian participation in flagship ‘big science’ projects, based on active multilateral engagement, will be crucial to making deep inroads and reducing costs. Examples like the Large Hadron Collider and Square Kilometre Array Telescope are motivating illustrations of how such endeavours can work. In the energy realm the $20 billion International Thermonuclear Experimental Reactor (ITER) project for future fusion power is an archetype. But similar collaborations are needed for a range of the most promising technologies, with Australia ‘in the mix’ in terms of contributing to both innovative science and ongoing financial support. To realise this vision, Australia also needs an educated and engaged society that understands and embraces the need to pursue new – often unfamiliar – energy technologies. This will require a strong and sustained focus in the school curriculum on science and engineering, coupled with improved public outreach for all ages. People must be encouraged to think critically about sustainable energy options and the trade-offs Australia must inevitably face. BARRY BROOK is an environmental scientist who models global change and holds the Sir Hubert Wilkins Chair of Climate Change at the University of Adelaide. 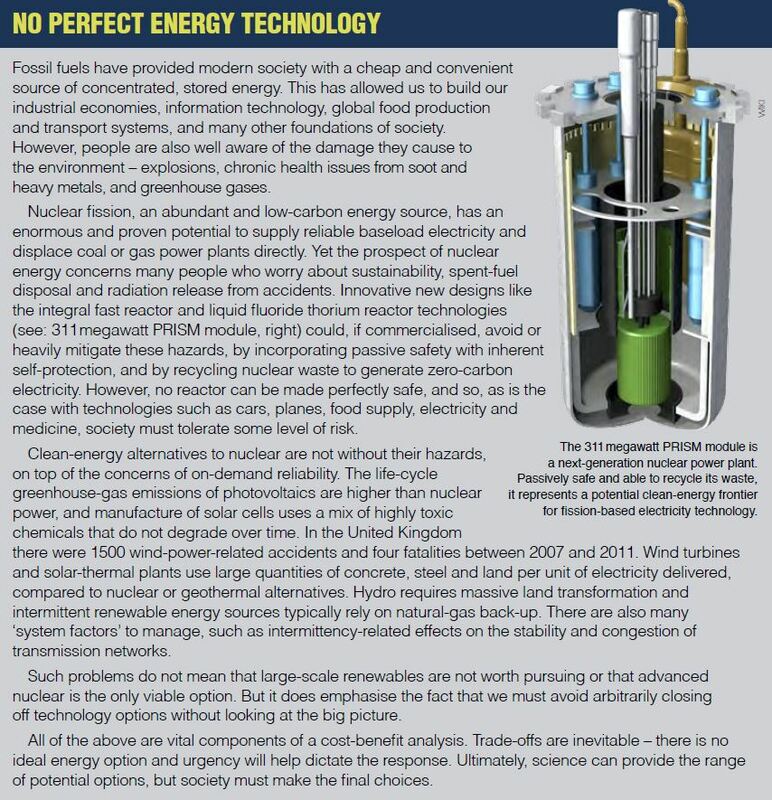 Solar and wind capturing devices are not alternative energy sources. For the physical devices – for wind, photovoltaices, solar hot water, hot air panels – the sun and wind are there, are green, are sustained. The devices that are used to capture the sun and wind’s energy are an extension of the fossil fuel supply system. I haven’t read the chapter yet (will soon) but wonder if someone could tell me the cost of nuclear accident insurance per MWh, and provide a link to an authoritative source. Or check my simple calculation below. Coal burner capacity factors are rarely much above 75%, at least in the USA. 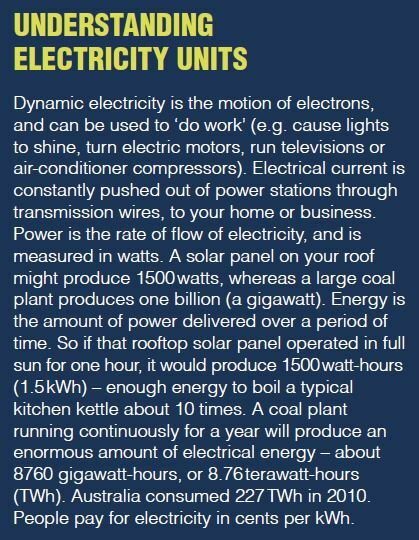 So a typical coal burner only generates for about 0.75×8766 = 6574.5 hours per year. David B. Benson, The reason coal has a lower capacity factor than nuclear is because of how it is dispatched. it is more flexible than most of the existing nuclear plants, so it is more likely to be operate less often, or at reduced power, than nuclear. There is an spectrum from diesel generators, to simple gas turbines to combines cycle gas turbines to nuclear. Nuclear is dispatched most and diesel least. Diesel may be able to run at 98% capacity factor but it would be far too expensive, so it runs at less than 1% capacity factor. Simple gas turbines are economic for peaking power below about (say) 10% capacity factor (because they use stacks of gas and it’s expensive). Coal at anything from about 30% to 95%. Nuclear at 50% to 90%+, but the higher the capacity factor the cheaper is the electricity because fuel is cheap and financing on the capital cost is the highest of all technologies. Guy Gadois posted a broken link. Does anybody know the correct URL? BTW, regarding site rules for posting of links, a short description of the content and relevance of the linked material is not optional. Right on both counts. Comment deleted accordingly. Your link is to a very interesting effort by some Canadian Greens to open their party’s collective mind to recognition that timely achievement of a low carbon electricity solution will include nuclear power (a) in the short term, using existing and upgraded plant and (b) in the future, using inherently safe nuclear designs when they become available. I particularly enjoyed reading the discussion contributions centred on “inherently safe”, both from enquirers and those responding to questions. The Canadian Greens are clearly far further advanced in their thinking that the Australian ones are. In Oz, our Greens are tethered to 1970’s policies by the likes of Senator Lee Rhiannon (NSW) who is a leader in the “don’t even think about it” team.